Child abuse and child sexual abuse in a character’s history and not depicted directly on the page. "Every minute of this story entertained me . . . . This is going straight to [my] best of 2018 shelf." "It’s a thrilling ride. I never knew what was around the corner! . . . This series gets better with each book! The pacing is great and shifting from one point in time to another is exquisitely done. I was literally hanging on every word and enjoyed each moment!" 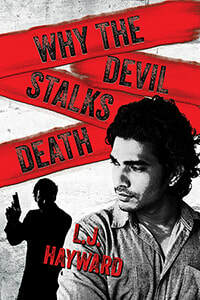 "Why the Devil Stalks Death was a nerve-wracking experience – full of action, intrigue, lies, emotion and heartache. . . .
Miss Hayward knows how to deliver a a thoroughly entertaining and suspenseful story!" "Hayward does an amazing job building these two timelines and it makes the story incredibly intense and exciting. She is just masterful at taking the story back and forth and having it not only make sense, but enhance the storytelling by connecting the two timelines in such interesting ways. ​If you like romantic suspense, you must be reading this series, trust me. Hayward is just masterful and these characters are so fascinating, this series is not to be missed." "I’ll just say that we get to see more mystery, more excitement and a few oh no, and omg moments. "This is one of my absolute favorite series of this year, and pretty much all time, and there is a reason for that... L.J. Hayward GIVES GREAT STORY!!! This series is so freaking brilliant"
"L.J. Hayward keeps you on your toes in this fast-paced, danger filled novel; it’s a roller coaster ride of a sequel to Where Death Meets the Devil. . . . It’s also packed with raw emotion from Ethan and Jack, and it will tear at your heart to the point you don’t know if they can survive all the chaos around them." For some extra information on Why the Devil Stalks Death, check out my guest posts on the blog tour.